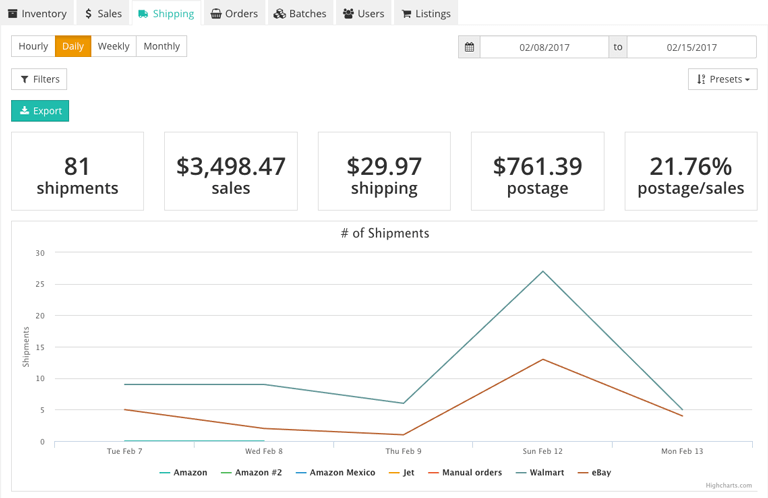 The Shipping tab will outline some at-a-glance shipping metrics for a given time range, such as the total number of shipments and their postage. Shipments: The total number of shipments processed within the selected date range. Sales: The total sales revenue in shipments processed within the selected date range. Postage: The total postage costs in shipments processed within the selected date range. Postage/Sales: The percentage of sales revenue within the selected date range that is made up of postage costs. Service: The name of the shipping method through which orders are shipped. Box size: The length, width, and height of the box used for shipping. # shipped: The total number of shipments processed with the box size.